Whether you are seeking to enhance your current career, switching to a career, or starting your own business, an MBA degree provides a wealth of opportunities for enterprising business professionals. An MBA from an AACSB-accredited business school gives both you and prospective employers confidence in your understanding of foundational principles from a range of business disciplines. Concentrations allow you to specialize in critical business functions, establishing the expertise to lead and build your career in the areas that interest you most. Furthermore, with an MBA from RIT your knowledge is enhanced by a technology and innovation focus that employers desire. Through a combination of transferable and specialized skills and knowledge, MBA graduates position themselves for higher earning potential and career advancement. Here you will find information regarding outcome data collected by our Office of Cooperative Education and Career Services, as well as median salaries for every program at RIT. You can also view RIT's Careers and Employment Trends page, which includes both Job Outlook and a summary of career outcomes for each’s year graduating class from RIT. 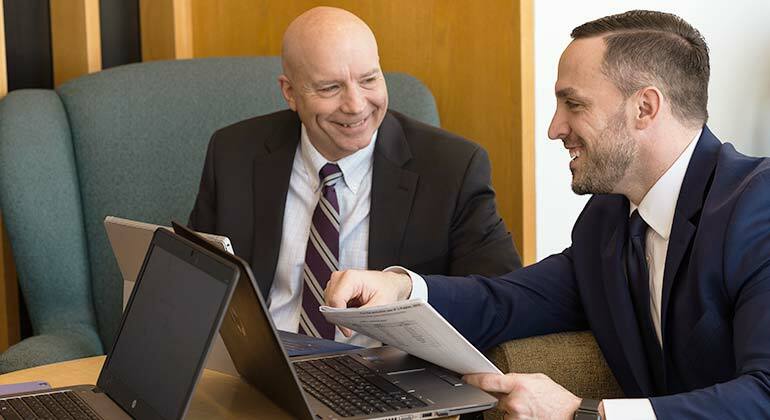 An MBA from Saunders provides students with lifelong connections with other alumni. Learn about where alumni are today, by clicking LinkedIn Career Insights for insights about Saunders MBA alums. Connect with fellow alum on LinkedIn. Alumni can join the LinkedIn Group to make connections between Saunders students, faculty and other alumni. Or check out some MBA alumni profiles on LinkedIn, to find and connect with fellow alumni. Add your MBA to your LinkedIn Profile by clicking the button below. "I would recommend RIT because I feel the degrees offered are worth the time and money. The goal is to prepare you for the real world."